Square Books, in all its glory. The sun is shining, and a calm breeze blows past me as I stand within Courthouse square, located in Oxford, Mississippi. My eyes glance from the Lafayette Courthouse, to the orange, aged building before me; Square Books. The building itself looks spotless, as if it were only there for not even a decade, even though it’s probably older than most. While the building isn’t a skyscraper, it stands tall at three stories. I can see within the window display a sign welcoming any and all who pass the location. In reality, I am sitting atop a comfy computer chair, staring at a zoomed-in version of Google-Maps, with a succulent PBR next to me. Virtually, however, the confines are what we consider place, are distorted, and I am standing right in the heart of Lafayette County. 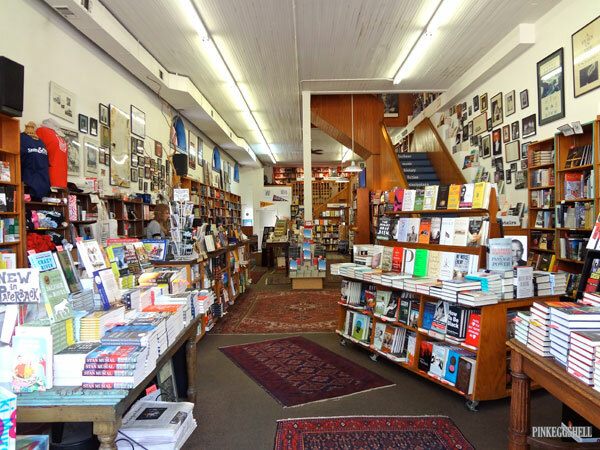 In exploring the independent bookstore that is Square Books, it is important to always pay attention to what each section adds to the overall definition of the stores individual space, and place. Before stepping foot in any bookstore, let alone any establishment whatsoever, it is important to understand that there is a certain bias to the store itself. Staying in terms of independent bookstores, every single bookstore has an owner, who themselves have their own opinions on literature. As renowned book-collector Walter Benjamin, in his piece Illuminations, every collector has a passion for literature, and said passion “borders on the chaotic” (Benjamin 60). While bigger bookstore chains may have a wider pool to choose from, independent bookstores rely on the collecting of books by a small group of individuals. Selections may vary, and border on the line of obsession. Remember, though, it’s healthy. The ground floor of a bookstore, in terms of individual expression, shows off the heart of what that specific bookstore entails. Walking into Square Books, at first glance, my eyes quickly skim the surrounding environment. There are intricate carpets amongst the floor, as well as bookshelves as far as the eye can see. Peering at the massive bookshelf on the other side of the bookstore, one can tell how significant “Mississippi Literature” is to Square Books, as it encompasses of the wall. Apart from having its own section, another section of the ground floor is dedicated to“Mississippi Mysteries”, which encompasses mystery novels written by Mississippian authors. Just from looking at these sections alone, one can surmise that the identity of Southern literature—specifically Mississippian literature—is quintessential to the independent bookstore’s identity. Apart from the southern literature, the ground floor itself encompasses a wide variety of texts, such as “Just-in Hardcovers”, and even a section on business. From an entry level glance, Square Books as a place is deeply rooted within Southern literature, yet it offers literature that includes other audiences.There are two staircases that lead to the second level of Square Books, both having artistic steps labeled with the sections that reside at the upper levels of the store. The rugs guide you throughout the store. In terms of hierarchy, the second floor can be described as “second best”, or rather what is considered the middle-tier of literature. Square Book’s infrastructure, however, does not entail a second floor, but rather a narrow hallway with several bookshelves, overlooking the ground floor. Subjects such as “Religion”, “Sexuality”, and “Philosophy” can be found within narrow walkway between two staircases. The space itself is small, which causes me to perceive the bookstore as not deeming those subjects as important as the other categories in the store. Instead, they have tucked them neatly aside, away from the main gaze of their audience. The works of Foucault, and Camus, are in a manner of speaking forgotten amongst the sea of literature that Square Books possesses. Consider, though, the addition that the overlook of the store adds to the definition of Square Book’s place. If the hallway isn’t crowded, one can stand freely, and look out onto the rest of the other occupants of the store, in an anthropological game of sorts. Imagine for a second viewing people walking around the store, and picking out Mississippian mysteries. You can see the type of people that choose certain types of literature, as well as what demographic of individuals frequent the store. While it may seem strange, in this addition of self-reflection, Square Books grows as a place. It is a bookstore that you can not only peruse literature, but also a hub of literary culture, that allows for a special ocular analysis. The view is breathtaking, to say the least. As with the other floors in the conception of space hierarchy, the third floor signifies the area which should encompass the crème de la crème, or the best of the best. I am met with “Sociology” on my left, and “Music”, “Poetry”, “African-American literature”, “Nature”, and “Science” to my far left. In my own opinion most of these subjects deserve to be at the top, however the order by which they are categorized has left me in a questionable state. Why is “Sociology” the first bookshelf I see? Why are “Nature” and “Science” on opposite sides of the same bookshelf? Furthermore, why is “Nature” at the top of the bookstore, whereas “Philosophy” is only on the second floor? Obviously, Square Books as a place must value Nature above Philosophy, which isn’t necessarily a negative attribute to have. It does however assist in defining where Square Books places emphasis. The best photograph that could be found of the questionably categorized bookshelves. Walking past the questionably ordered bookshelves, as well as the wide exit/entrance staircase, I find myself standing within a cafe within a bookstore. And it isn’t even a Starbucks! The cafe doesn’t take up a majority of the third floor, and even has seating for those who care to chat and drink coffee while they read. As a place, Square Books offers not only literature, but an environment in which one can eat, and interact socially with others. The walls of the cafe, which act as walls for the room past it, are lined with “On Writing”, “Literary Non-Fiction” and “Southern Studies”. It is past the cafe, inside of the smaller section where the true treasure of Square Books lies. To my right, I can vividly make out a large display entitled “Faulkner”, where the owner has consciously ordered all of Faulkner’s works into one corner of the floor. Not only do his works garner their own section in Square books, but literature that critiques his own work have their own section as well, appropriately located on the bookshelf right next to it. Let us take another approach to understanding the attraction that is the Faulkner corner. As Clifford states, in his piece “On Collecting Art and Culture”, a bookstore acts in an ethnographic fashion, as each individual bookshelf acts as “diverse experiences and facts” that are “selected, gathered, detached from their original temporal occasions, and given enduring value in a new arrangement” (Clifford 231). 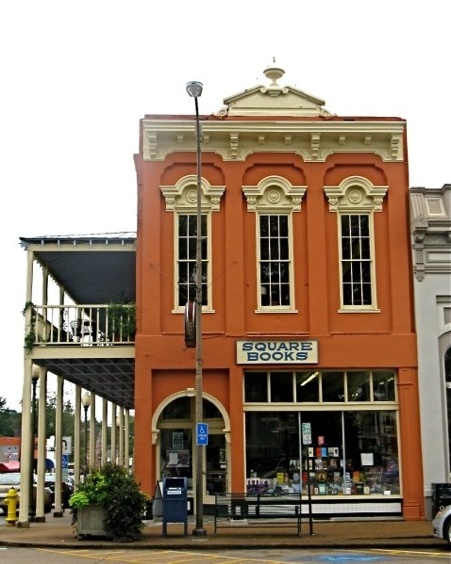 In both collecting, and displaying the works of Faulkner in a special manner, Richard Howarth, owner of Square Books, has detached Faulkner from his original time period, and has instead acts as a new arrangement. Faulkner acts as an emblem for Square Books, as he emphasizes the literary side of Oxford, Ms in its entirety. Benjamin, Walter. “Unpacking My Library.” Illuminations. Ed. Hannah Arendt. Trans. Harry Zohn. N.p. : n.p., n.d. 59-67. Print.